Local Electrical is owned and operated by Chris Tweedie, a master electrician with over 30 years experience. His team has an incredible wealth of experience and expertise from years in the field. With a range of extensive services, they will meet and exceed your expectations. Do you need assistance with installation and maintenance around your home or business? We can help, as our electricians are fully licensed and qualified to do the job, and to do the job right, the first time. Have you found yourself in a pinch after hours? We understand that not all electrical problems arise during normal business hours, so we have after hours and emergency service teams at the ready that you can rely on. The professionals at Local Electrical pride themselves on doing a job well and building trust with our clients, as it’s an important aspect of our successful business. Jobs will be completed in a thorough and speedy manner, as you will come to rely on our expertise. 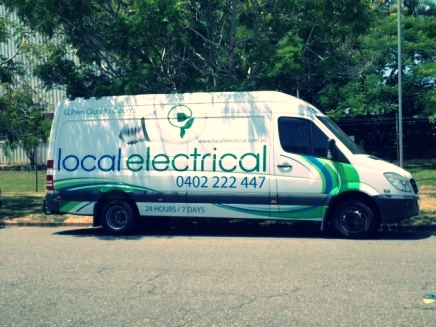 If you have questions or need more information, please give our Brisbane based team a call at 04 0222 2447 or send a message on the Local Electrical website. We are happy to provide free quotes over the phone for your next electrical project or if it is a large or complicated project Chris will come onsite to quote. The friendly professionals at Local Electrical look forward to taking care of all your electrical needs when you need us.